Visit the FRG website for training information. Free child care may be available for one-on-one sessions and some of our daytime workshops. Please address this, when you call to make a reservation for a class. Children must be registered with CYS and you must contact Clarkmoor Hourly Care Center at 253-966-2491 to reserve a slot. If you are interested in a one-on-one class/workshop, please call one of the Mob/Dep Specialists to schedule an appointment. Register for upcoming workshops at jblmdpfr.timetap.com. FRG Training is also managed by Mob, Dep & SSO. Visit the FRG website for training information. Family Care Plan – Required by AR 600-20 Chapter 5: Dual military with children; Single Soldier with children; EFMP concerns, etc. 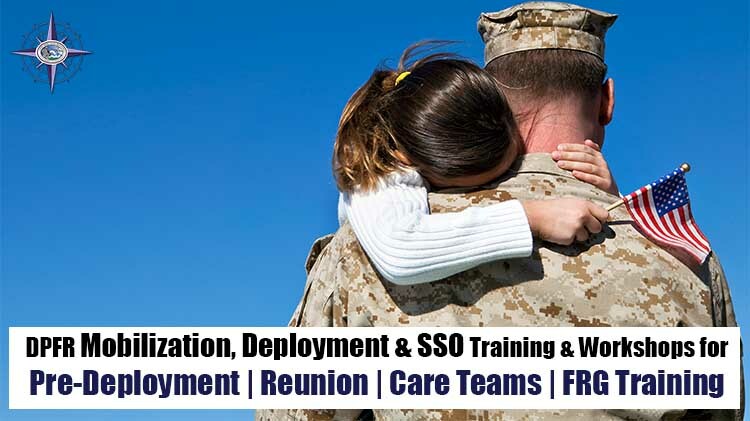 Family Contingency Plan – Non-required Family Care Plan is for the use of a Soldier married to a civilian and who has children. We suggest all families discuss initiating a Family Care Plan in the event of a deployment, non-command sponsored tour, or extended TDYs. It is best to have a plan in place for the care of your children should a traumatic event take place when the Soldier is away, i.e. hospitalization of spouse. Who will legally take care of your children until the Soldier returns or the spouse is capable of caring for the children? The notarized documents would go to the proposed guardian, a copy would be kept by the spouse in a place that is easy to find and a copy may be given to the Command or Rear Detachment Command.